Note what signs you see. I (W. Wertelecki, M.D.) 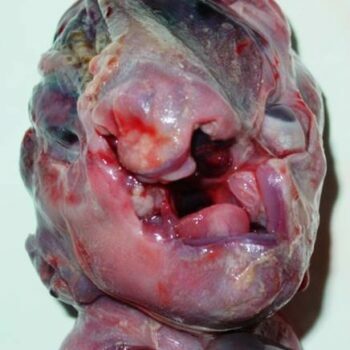 see a disgruntled dysmorphic infant. 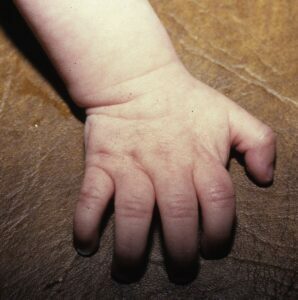 The most obvious signs are a flat upper lip (no filtrum and thin vermillion); short nose; a pectus excavatum and rigidity most evident in the fingers. 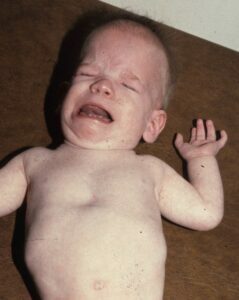 CAVIAT – it is a bad idea to diagnose the flat filtrum or thin vermillion when a child is crying – my statement is based on other images when the child is relaxed.